We all thought that Baby — that’s what we call him — was going to arrive early. Shelly thought so. The ultrasound technician thought so. And most of us family members were betting on a June arrival. In fact, Shel’s parents were so confident of his imminent birth that they drove out from Michigan’s Upper Peninsula, unbeknownst to anyone, and surprised Pete and Shel a week ago. And Cam and I made sure that our schedules were clear this Fourth of July week so we could be present for the birth of our first grandchild. So here we all are in Boulder, Colorado — both sets of grandparents — waiting for Baby. And I’m discovering that there is much you can do while you’re waiting for Baby, much you can do while you’re trying your hardest to stay out of your son and daughter-in-law’s hair. Thankfully none of us are setting up camp with our kids in their condo. That’s a plus. And there’s shopping in Boulder, businesses, like the Apple Store, that don’t exist in our rural environment. So that’s the place I hung out on Day One. I bought the Macbook Air, my story-telling traveler’s dream computer, thin and light enough to slide into my traveling purse. And I’ve already had my first lesson, learned to navigate the screen without a mouse, learned to type on this tiny keyboard. And there’s hiking — trails that lead to trails that lead to trails. In the few days before Cam joined me on this Waiting-for-Baby- Adventure, I found Hall Ranch, a network of paths near the town of Lyons, and, each morning, before the sun rose high and hot, I set off into the sandstone foothills near Boulder, Colorado. The other day, as I wound around a corner on my morning hike, I was startled by a western jack rabbit, a baby at the side of the path, nestled against the rock, in the sage and the grass. It looked at me and I looked at it, and then it turned away again, pulled on a piece of grass and kept on nibbling. “I love you, Bunny!” I sang to the baby. “I’m so glad you were born!” Peter was our first baby, born in Ann Arbor, during the winter of Cam’s junior year of dental school. It was a busy time for Cam. I remember he brought his green-covered anatomy text book to the hospital while I was in labor, thinking he might have a chance to study for the next day’s test. And after eighteen hours of hard work on both our parts, at exactly ten that evening, when Pete was born, that book was nowhere in sight and I’m not sure we said the exact words, but we were thinking them, “I love you, Baby! I’m so glad you were born!” We were smitten. And somehow we did it. Somehow Cam did it. I think he took the test the next day. And he learned to make crowns that shined bright, and he learned to drill and fill and become the amazing dentist that he always has been. And, during that time, he carried that baby who is now having baby around in the front pack and he swaddled him and he changed his diapers and he loved him dearly. I was thinking about Cam, and I was thinking about Pete as I climbed up over those sandstone ridges at Hall Ranch. It is easy to appreciate the mother-to-be, to see her as heroic. And Shel is heroic. She’s heroic as she, at nine months pregnant, makes her way to work each day. She’s heroic in her gumption, in her humor, in her creative fire, in her generosity to include all of us during this sacred time. She’s going to be a wonderful mother; she already is a wonderful mother to this baby she is carrying. And Pete, he is heroic too; that’s what I was thinking as I walked along. Like his father, he is carrying a pile of books and a weight on his shoulders. It is the summer of finishing it all up, the last touches on the dissertation, the papers for publication, the college class he is teaching. And he is doing all this while keeping his spirits high, while remaining an uplifter to us all. His grandfather was an uplifter, and somehow my mind wandered as I wandered on this morning hike from my son to my father. For many years, I felt the hole of a missing father. My father died when I was seventeen, and I think I acutely missed him because he was the person who “got” me the most. It feels amazing to be appreciated, to be seen, and it is especially wonderful when you have a parent who understands and appreciates you in all your quirky spirited humanity. I have come to realize that I am fortunate, that I carry my father’s love with me, that he is present in my present, that he is present with his grandson too. So what better thing can I be doing right now? Than to say to my son who is about to be a father that you are awesome, that I get it, that you’re working hard, that your efforts are heroic, and it is touching the way you love your wife, the way you love your baby who is about to be born, the way you stay positive and upbeat as we all hang around waiting for Baby. “There is always something to appreciate, if you look for it, in every moment.” I say these words often in the gentle yoga classes I facilitate at Joy Center as we reach for the sky in Star Gazer pose. And when you’re doing something that you love, it’s easy to settle into that place of appreciation, like it was for me last Friday evening as I hiked along one of my favorite trails in Ishpeming. The setting sun flickered through the trees and the world seemed golden and the gifts kept coming my way. “I appreciate . . . I appreciate . . . I appreciate . . .” I kept saying to myself. First it was a bunny that hopped across the trail, then it was the glistening of a dragonfly and the screech of a hawk and a deer who stood there and just stared for the longest time. And, an hour or so into this spacious evening adventure, as I walked by a marsh filled with blooming purple irises, the cell phone in my pocket rang, and I appreciated the conversation that I shared with my son Chris, who lives in Salt Lake City finishing up his doctorate. And after Chris and I said our good-byes, as I turned back in the direction of the car, my mind wandered to another walk where I also had immersed myself in this practice of appreciation. It was six years ago, and it, too, was in the glorious spacious time of summer. Except on this particular day, I wasn’t feeling glorious or spacious. We had just driven across the country from Michigan’s Upper Peninsula to Salt Lake City, at the beginning of Chris’s graduate school time. And although there had been many grand moments on this trip out west, the quarters had been tight and the U-haul that we were hauling behind our car kept fish-tailing and we were all tired and cranky and the time in Salt Lake City was passing us by quickly as we helped Chris to get settled. I was grouchy. My body needed to move. My spirit craved a climb in those mountains that we could see from Chris’s lawn as we unpacked the U-haul. So, on Day Three, I claimed some time for myself, an early morning walk, not in the mountains that I longed for, but on the streets of Chris’s neighborhood. I decided that I would make the best of it, that I would look for things to appreciate in this city that was my son’s new home. And I was a warrior for appreciation that morning; sometimes it takes that kind of focus, when you’re mind is wanting to veer in the direction of self-pity. I appreciated the houses that lined these sweet streets, small storybook houses, with sweet front porches. I appreciated the roses that bloomed in the gardens, the cat sitting on a lawn. I appreciated the blue blue sky and a day that was fresh and clear. I appreciated that, after days of sitting in a car and unpacking boxes and shopping for bedding, I was moving my body and my heart was pumping. I kept walking and I kept appreciating and I kept feeling better and better, until I realized that I was feeling pretty darn good and it didn’t matter if we had a chance to go hiking in those mountains. I appreciated myself into a feeling of joy. I appreciated myself into a neighborhood that I didn’t know. And it didn’t matter at that point because I was appreciating everything. I’d find my way back. And that’s when I wandered into the alley that had the big dead-end sign perched at its end. Except it wasn’t a dead-end after all. Because I met a new friend. He had just parked his car, a giant old stationwagon stacked high with painted canvases. And he was opening his door, this tall chipper gray-haired man wearing running shorts and sneakers, and I approached, asked for directions. There was a short-cut, he told me, a path through the woods, beyond the dead-end sign, and he pointed me in its direction. But then we started to talk. His name was Zwi and now I can’t remember what that means but at the time I loved having a friend with the name of Zwi, a friend who talked about art and radiated energy, a friend who also was a warrior for appreciation. He wrote down places for us to eat, Indian food and Middle-eastern food and fresh organic local food; he told me of a bookstore that had poetry readings. He showed me his art painted on the canvases in his car, and we hugged, said so long, new friend, and farewell. And I easily found my way back, to my family, to the rest of the day, to my Self. And, last Friday evening, I found my way out of the woods and back to my car, and I climbed into bed filled not only with the fragrant fresh smell of early summer and a treasure chest of appreciations from my hike, but also with the memory of my Zwi story, that no matter how we are feeling, there is always something to appreciate and when we choose to head in the direction of appreciation, we are gifted in the most delightful and unexpected ways. So here’s to a summer of appreciation, to finding those gifts, to savoring them and sharing them. Here’s to a summer of play at Joy Center, a summer of yoga and singing and drawing and dancing and writing and book-art, a summer of calling ourselves back to our very core where we know that there is so very much for us to appreciate. The June air was clear and cool and sweet, and the setting sun flickered through the trees and into Joy Center’s main room. Jerry Mills was lit up, center stage last Wednesday evening, performing his songs to an appreciative audience. His songs stand by themselves, glorious story ballads that rise up from some deep soul place inside of him, songs that he sings with his whole heart, songs that stir our hearts as we listen. I’ve been listening to his songs for the past few months, ever since I first met him at the TedX Conference in Marquette back in April, cranking the volume up each day and singing along as I putter-clean my home. And this would have been enough, his singing last Wednesday, but there were the stories. The stories in between the songs, the stories that sometimes interrupted the songs, the stories that embellished the songs. Jerry Mills is Irish, has the gift of gab, is a master story-teller; in fact, he has made a profession of traveling the country inspiring people with his stories. So last Wednesday, we the audience were entertained and touched and transported as story and song mingled together in the sweet summer-like air. There was the story and then the song that followed the story about a miner, a family man, working the midnight shift, that stirred me as I felt a love for my neighbors, so many of them who work at the Tilden. And there was the story leading up to another song, one entitled, “Grateful”. The story, a litany of magical almost unbelievable moments in a day of allowing the magical almost unbelievable moments to flow, made me grateful for magical almost unbelievable moments, and made the song, which was already alive, even more vibrant. And there was the one about a road trip to Maine, one that included a moose and the rocky coast and the lobstermen, one that led to a song that he had never sung in public before. There was story after story, song after song. Near the end of the performance, Jerry began another story to introduce the song, “Believe”. He explained that he had been contacted back in the summer of 2005 to speak at a town in Mississippi that had been flattened by Hurricane Katrina, and, of course, he had said yes. And then he went on to share with us his process, how the stories, the speeches, the what-to-say-to-a-particular-group, comes to him in the days leading up to an engagement, usually in an easy flowing way. But this had felt so big and nothing was coming to him. So, he told us the story of how he brought his guitar to Presque Isle and he sat on a log and he listened, on this gloriously clear day, to the Lake, to the gulls, and to his own inner voice, and a tune began to rise up, and the words began to flow, and he strummed his guitar and he began to sing, out loud and free. And a song began to take form, a song of hope out of devastation, of still standing when all else has fallen, a song of believing. And then Jerry paused, in the telling of his story. And we, in the audience, paused with him. And, in that pause, I am feeling it, the clear air, the smell of balsam, something taking form . . . He looks at me and I look at him. “I think it was you!” he laughed. The smell of balsam, a blue lake in July, my writing journal, a song in the air. . . “It was me!” I cried out. And then, with all of us laughing, he finished his story, how the woman said, “thank you!” but she couldn’t quite hear the words. And that’s when he sang it to her, and his song, his brand-new song, found its first audience on the shores of Superior. So last Wednesday, as Jerry began to sing again, this song that I had first heard seven years ago, it all came back to me, how it almost was too much, a gorgeous summer day, a tall Irishman I had never met before, singing to me a brand-new song. I remember how I scurried to my car, forced myself to breathe, to breathe it in, this gift that I had just received. But I don’t think I did. Not all the way. Not until this moment at Joy Center, when I breathed it in again, this song with the title “Believe”, breathed it in deeply, in an almost unbelievable moment in an evening of magical moments. It started as a lark, “a wouldn’t it be fun if . . . ?! ?” kind of thing, the way our boys, when they were in high school and college, used to fantasize, wouldn’t it be fun if . . .?!? Wouldn’t it be fun if we didn’t have to get real jobs, if be bought a cow instead, sold the milk to our neighbors?!? Wouldn’t it be fun if we bought a cart with a catchy tune and bicycled around the neighborhood every afternoon at the perfect time when kids were starving for ice cream. It started out like that back in February as we sat around Joy Center’s art table, folding and cutting and binding our books under the guidance of our fearless Book Art leaders, Amber and Raja. Esther had been attending the monthly gatherings since late summer, shortly after she had moved to Gladstone from the east coast, and, now, in the midst of the U.P. winter, we were learning that she was moving again. At first we were dismayed. She is a bright light at the monthly meetings, a book-binding goddess who inspires and delights. We didn’t want to lose her. But then, we rallied; with our Yooper mentality, we focused on the positive. She wasn’t moving to Alaska or China or Timbuktu. Duluth wasn’t really all that far away. It was me who piped up first. “Wouldn’t it be fun if we went on a road trip!? !” I exclaimed. “A Joy Center Adventure!” And then I remembered the Black Cat. I love the Black Cat! For years, the whole time our boys were in high school and college, the era of track meets and ski meets and St. Olaf College functions, Ashland, Wisconsin, three hours west of our home in Ishpeming, became a familiar road stop. There was the bread store with European-style treats that even the gluten-intolerant would want to load up on, and the Co-op across the street, and there was the Black Cat beside the Co-op, with its coffees and teas and healthy sandwiches and salads and soups, with its funky art exhibits and its century-old tin ceilings and brick inner walls. “We should meet up in Ashland!” I cried. “The Black Cat Coffee House is the best! And they have tables in the back where we could work on our books!” That evening in February, the lark became a lark song and the whole group began to sing. Amber and Raja were game, and Laurie and Cece climbed on board as well. And Esther was thrilled that we would even consider such a trip. And that evening of fantasizing, as high vibe as it had felt back then on that book-binding February night, became a distant memory in the busy days of spring, and, other than a few more “wouldn’t it be fun if’s . . .” not much else had been said about our Ashland road trip. Frankly I thought it had gone the way of the backyard cow and the ice cream cart, that it was just a fun adolescent fantasy. But remember how some of those fantasies, some of those teenage joy rides, found their way into the world of matter? And remember how you could hardly believe it when it started to happen? It was like that last Thursday morning as we met at my husband, Cam’s Dental Office parking lot, shortly after 7:00 AM. There we were, Amber and Raja, Laurie and Cece and me, and there was Matt, too, who had climbed on board this not-really-that-well-planned-out trip to Ashland at the last minute. 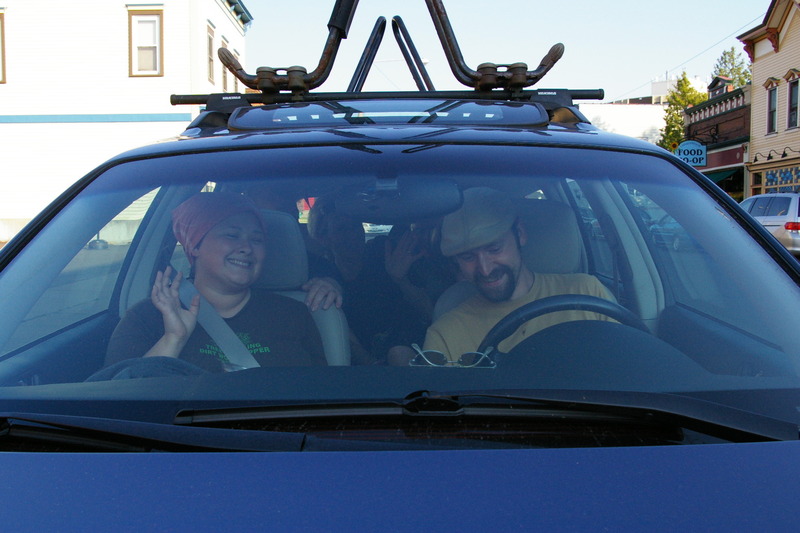 And with Matt on board, I wasn’t sure how we were all going to climb on board of my five-passenger Subaru. But climb on board we did! We crammed into that Subaru, buckled in as best we could, and Matt, he made a nest for himself in the back, and our adolescent “wouldn’t it be fun if . . .?! ?” became an adolescent reality, a Joy Center joy ride! And I’m thinking now that our send-off made it even more fun, because, as I handed the keys over to Raja, and he and his fearless Book Art co-leader Amber took their place in the front, as I scrunched into the backseat on the hump in the middle, Cam, not looking quite as adolescent in his shirt and tie, stood there in his office parking lot, shaking his head. “I don’t think you can do this!” he muttered. “There are too many of you!” And I smiled and I said that we’d be fine and I waved back at Cam as Raja took the wheel and steered us west. And I meant it. I knew that we’d be fine. I knew that Raja the mechanic was a sensible, safe driver. I knew that we weren’t really adolescents, that we book-binders were a sane grounded bunch of adults. And yet it felt a bit naughty squished in like that, in the back of my very own car that didn’t even feel like my own car anymore, on a road trip that was thrown together at the last moment. And it felt fun to be out on the open road on a summer-like morning in early June with my fellow tribe members, the Jack Kerouacs’ of book-binding. I think we all felt young again. The playing field had equaled itself out, with the youngest of our tribe in the front seat. And the stories – they poured out of us and the laughter was snort-filled and although Raja stuck to the speed limit, the three hours flew by, and, before we knew it, there we were, on a side street in Ashland, parking right in front of that European bread store, right across from the sweet brick building with the Black Cat sign. There we were walking through the door and into our “wouldn’t it be fun if . . .” fantasy. And meet Esther we did, who had taken her own road trip east, and we marveled that we had done it, all day we marveled that we had done it. And they loved us at the Black Cat, loved that we had driven the distance, that we had said yes to this trip. And yes, we did say, yes to this trip, to a day of book-binding on a dimly lit table in the back of a coffee house, to a day of sharing our visions for this up-coming season, to a day of walking along the shores of Lake Superior, to a day of nachos and sandwiches and teas and coffees. And, it was big hearty yes that we had said to the teenager inside of each of us, to that part of us that still loves the open road and the impulsive adventure. We didn’t even pay for our own food. I had grabbed a stash of bills that I’d put aside at Joy Center after my mother’s passing, from a very small insurance policy that she had left for her kids, a stash that I now realized was meant for this very day. “It’s on my mother!” I cried out. “It’s on Grandma Annie!” So all day, as we drank and ate to our hearts’ delight, we raised our hands to the heavens and we thanked Grandma Annie. And all day, I raised my hands to the heavens and I said to the heavens that I can’t believe it, that I’m having so much fun, that this time the “wouldn’t it be fun if . . .” really came true. How are you going to make the next thing fun? We had been sitting still for way too long. The air was stuffy and we were crammed in our seats and the two young boys, who were sitting in the row behind me, began to squabble. They were antsy. I was antsy. And in my antsiness, I began to question the whole plan. Why, on this first weekend in June, was I buckled into this too-small-seat, on this too-small-plane, waiting, still waiting an hour and a half later, on the Detroit Airport’s runway to see if we, a full-load of passengers, indeed, would be heading anywhere? I always have had a purpose in my travels to Maine. And, as I squirmed a bit on our over-heated still-not-moving aircraft, I realized that that was what was missing. I had no excuse to be flying east for this particular weekend in early June. I could say that I was traveling to Maine to tend to tasks related to my mother’s July-held Memorial Service. I could say that I’m visiting with family and friends, or gathering materials for an article, or bringing my cousin a belated birthday gift. And all of these things seemed sort of true. I was the bearer of gifts for my cousin, I did want to visit with my brother and friends, and I suppose that there were things to discuss for my mother’s service. And, of course, I’m always gathering material for an article or poem or story; that’s what writers do. But, in that hour and a half of waiting for the mechanical problem to be fixed, in that time of feeling squished and squelched, I had a moment of foot-skipping liberation. I realized that I didn’t need an excuse, that we never need an excuse, that we truly can allow what feels good to be our road map or air map or life map. And who was I thinking I needed to explain myself to, anyway? It was me, my inner voice, that was demanding an explanation, that was saying, “You need a purpose, Helen, something loftier than fun, to guide your way.” And what was the belief under this demand, I wondered? That I’m going to look like a light-weight, that I’m not taking life seriously enough, that I’m spoiled and coddled and lazy? That no one deserves quite this much fun? Who cares?!? I realized, stuck on that plane, with the boys behind me, kicking my seat as they poked each other and my backside, as they wiggled their way into a better-feeling place, that finding our way to fun trumps it all. At least in my story. My father taught me about fun early on. He wore it on a regular basis, in his light-hearted gait, in the mischief in his eyes, in the stories that he told and the words he made up; he sang it in the whistle-tune that couldn’t help but pour out of his pursed lips. And, as a child, I walked beside him, held his hand, and breathed it in with that salty Maine air. I learned from him that fun wasn’t just a Saturday boat ride – although what could be better than plopping yourself down on the bow of your father’s lobsterboat, your feet dangling over the side and into the water, and your father steering and you knowing that he wouldn’t let you fall off and you laughing as the waves splashed high and the salt stuck to your face?!? A Saturday boat ride was always fun. But it also was fun to research a report when you loved the topic or to help your father hang an art exhibit at the local library or to know that at the end of the day – a school day, a work day – there your father would be, walking to the car and whistling and carrying a milk shake for you made with the best-tasting homemade ice cream from Hallet’s Drug Store because eating ice cream is always fun. We finally aborted our mission on that June morning-now-tipping-into- afternoon. All fifty of us passengers unstuffed ourselves from our too-small seats, stood up and piled out of our ailing aircraft and over to a new gate and a new plane and a fresh outlook that we would indeed make our way to our destination after all. And take off we did. And as we flew through the air, over Lake Eerie and Ontario and into New York State and New England, I felt purposeful in my lack of purpose. Fun has been my bandleader since the beginning and often I have had an easy go of it, marching to its tune. There have been times, however, that I’ve disguised the fun I’m having under a more serious cloak, a loftier purpose. And I have to admit that there have been other moments, many other moments, that I’ve squelched it altogether and it has never been fun to put a damper on fun. It wasn’t even a resolution that I made on the plane two weeks ago. It was more of a feeling, a feeling of freedom. No more hiding it. No more dampening it down. Not on this trip. Not in this life.